Prices of Space Saver & Under Cabinet Coffee Maker vary and differ significantly, but whether you choose one that costs above a hundred dollars or one that’s a little over $50, you need to compare units in terms of their features and check whether or not the features of the one you will choose match your family’s needs. Before you make a purchase, examine several units with regard to versatility, programmability, and aesthetics. 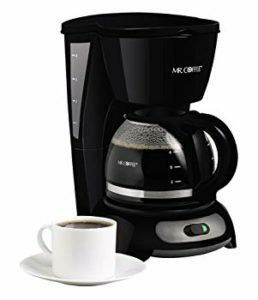 Many units come with auto-timers that allow users to set their machines the night before and get up in the morning with hot coffee waiting for them. This model is ideal for large families. It can produce 12 cups of coffee with each brew. Two other units in this review also have the same feature. 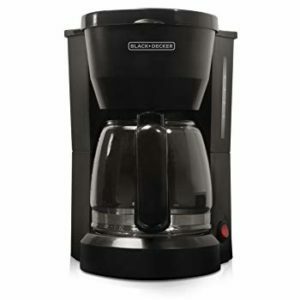 The Black & Decker 12-cup model is perfect for people who are working on a tight schedule. 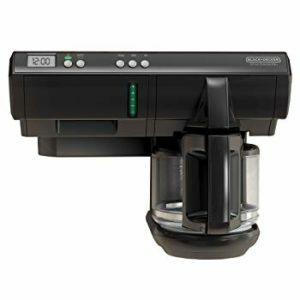 It is a programmable unit that allows users to save a couple of minutes in terms of coffee preparation time. This model comes with a plate that holds the coffee container firmly in place, a feature you must take into account if you will use your unit in an RV. When inserting the carafe, it will glide into place. When you hear a click, it means the container has been successfully put in its proper position. 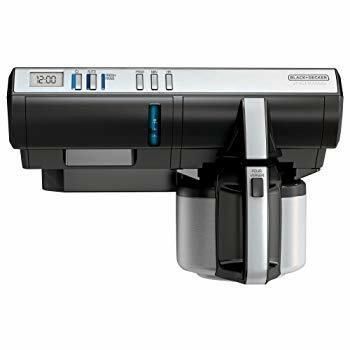 The Black & Decker SCM-1000BD coffee maker has similar dimensions with the model that will be featured next on this review. The height is 12 inches, the depth is 11.5 inches, and the width is 11.2 inches. Measure the distance between your cabinet’s bottom and the unit’s top part to make sure you have enough space before buying. You may have to remove your cabinet’s molding, if there’s any, to allow convenient installation. The distance from the coffee pot’s lower extension to the unit’s left side is about 8 inches. To be safe, add a quarter of an inch more. Some users place the safe distance at 8.25 inches. You don’t have to wire up when operating this unit. You just plug it into a standard socket with 110-v power. There is no battery backup, so you will have to reset the timer and the clock each time you plug it, which can be annoying to you. Putting water into the reservoir is easy. The unit has a removable reservoir that you can find at its filter’s left side. The reservoir slides out easily for refilling. Afterwards, just slide the reservoir back. When faced with carafe issues or any other problem with your unit, just give Black & Decker customer care a call. They will check if your issues are covered under the unit’s 2-year warranty. 3-year and 4-year protection plans are offered for this unit. If interested, contact SquareTrade. This company is a provider of extended warranty contract services. This is another programmable unit from Black & Decker. The major differences are volume capacity and exterior looks. This unit holds only 8 cups of water, and some parts of the unit’s body are made of stainless steel. The volume difference accounts for the lower price tag that this model comes with. It is priced $20 lower than the unit we have above. The dimensions are the same. There’s just a 0.3 inch difference on the width, making this unit slightly wider. There is no difference in terms of height and depth. Now, when you try to check the many features of this unit, you’ll find that most of them are also found in the model above. We give you a summary of features. Sneak a Cup – this is the feature that allows users to grab a cup at mid cycle. 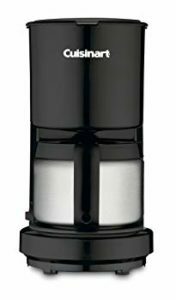 The carafe that this unit has is also made of stainless steel. Take note that the carafe is not replaceable. It is difficult to find a different carafe that can also fit the plate’s shape and size of this model. The carafe is spill free, an ability brought about by the unit’s serve button. This button is used for pouring and stopping coffee flow. You can replace the filter after use. 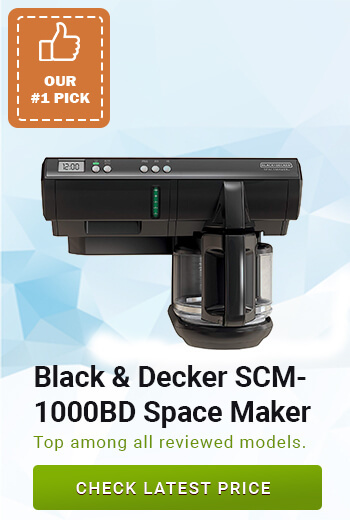 Good thing is most brands of permanent filters (8-12 cups, basket style filters) can work with this Black & Decker SpaceMaker. You have a 1-year warranty from the maker. That’s only one year, but you can increase the coverage to two years if you pay through your credit card. Consider a MasterCard payment to have another year of free-repair guarantee. Or you can avail of either a 3-yr or 4-year protection plan. To buy an extended warranty, contact Asurion LLC. Our third model is from Hamilton. It stands out for its varied brewing options for different coffee tastes. It offers three brewing options: 1 – 4 cups, bold, and regular options. The unit comes with a programmable clock and a 2-hour shut-off function. We think that “ease of cleaning” is an advantage for this unit. 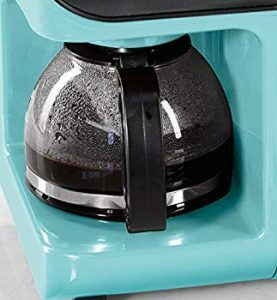 The water reservoir is removable, the plate that holds the carafe is non-stick, and there is a button to make its brew basket swing out from the inside. 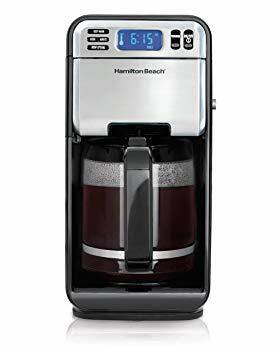 Similar to the two units above, the Hamilton model also allows users to get a cup of coffee while brewing is ongoing. If there is a need to do that, use the pause function. Get the carafe from the warmer plate and pour yourself a cup. Replace the amount taken and then push it back to the holder. It is good that the manufacturer of this coffee maker provided troubleshooting instructions/manual. The Black & Decker units have none of this, which is quite disappointing, considering that they are way too pricey in comparison to the Hamilton unit (source). This product comes with wheels for easy movement and access. We think that this wheeled base feature is an expression of the company’s friendliness to its customers. This is the model that we recommend to elderly people who need their appliances to be easily movable. The wheels of this unit are nothing that you can call big. They are a bit small and calling them “wheels” is a bit of an exaggeration. However, you will find the small rollers quite good at doing their job. So, all in all, the “wheeled” feature is a great addition that doesn’t exist in more expensive models. In summary, the Hamilton is a good option if you are looking for a unit that’s easy to move and easy to clean. With this one, you are assured of coffee with the right temperature, and with its brewing options, you can make sure that your coffee matches your taste all the time. For extended warranties, call the same insurance provider of the 8-cup Black & Decker. Coverage includes power surge and other electrical and mechanical breakdowns. 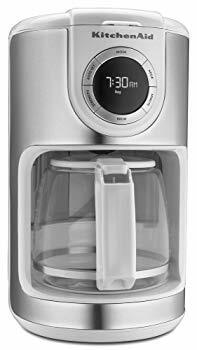 This KitchenAid unit landed a spot on our list not only because of its variable brew strengths but also for being BPA-free. We like the seller saying that the unit is BPA-free because many consumers also want to protect their families from harmful plastic chemicals when choosing products to buy (Source). It would have been much better if KitchenAid mentioned in the product description that BPA is particularly harmful to human hormones. However, the mere mention that the unit is BPA-free is already a good gesture. 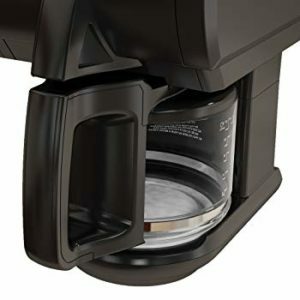 Moving on, this unit comes with a large carafe that can accommodate 12 cups of hot, flavorful coffee. Its water tank is removable for easy cleaning and refilling. Of the five units that we examined, only two have a flavor strength selector – the Hamilton unit and this unit. However, the KitchenAid unit does not carry the 1 – 4 cups options that the Hamilton does. That shouldn’t pose any problem if you have a big family, and you need to brew large amounts of coffee each time. The price of this unit is comparable to that of the Hamilton and is a little lower compared to half the price of our first Black & Decker model. This unit is also programmable, allowing users to set the brewing any time over a 24-hour period. Regarding noise, this unit is one of the most quiet that we know. It beeps loud enough, signaling to the user that brewing is over, but that’s all the sound that it makes. Some people, however, complain that the clock of the KitchenAid unit sometimes slows down – like losing five minutes over a week. If that happens to you, check with the manufacturer about warranty. If you’re buying it from Amazon, make sure to check the Warranty & Support section. You need to click a link there to get you to talk with customer service. There are concerns among users that units don’t stay put, but with this KitchenAid model, the manufacturer put rubber at the bottom so that it doesn’t wobble or vibrate at all. Some of the outer parts are made of plastic, but even without water in the reservoir, the unit’s weight and its rubberized base are enough to make it stay in place. Change the filter every 4 – 6 weeks. How often you need to change the filter will depend on your frequency of usage. The quality of water you will be using is also another factor to consider in terms of how frequent you must change the filter. Some users change filters only 6 times per year. 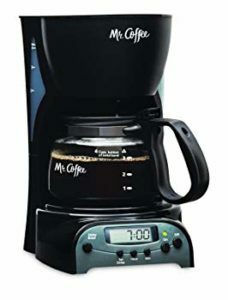 We’ve included the Nostalgia coffee maker because it is a multifunctional appliance. This is a good option to consider if you’re looking for an alternative to the KitchenAid in the same price range. However, with this unit, you only get to brew coffee a maximum of 4 cups every time. If you have a small family, this is the one we recommend. 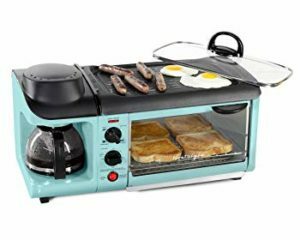 You can do three things simultaneously with this unit while preparing your breakfast. 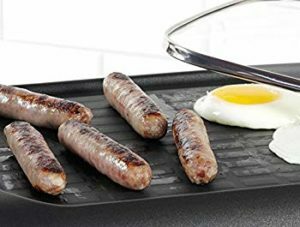 You can use its griddle to cook your bacon and eggs. The oven part is where you can toast your bread or reheat your cold dishes. Its easy-to-use controls will allow you to use the 3 components simultaneously. There is a timer that you can set to run for 30 minutes. It will automatically shut off all the three components after 30 minutes has elapsed. You can use each component separately. Cleaning the coffeemaker can be quite tedious. Although the griddle is non-stick, you will spend a good deal of time cleaning the interior part of the oven. Take it easy when using the griddle, because the edges are quite shallow that the griddle allows oil to drip over. To give you an idea of how big the oven is: the tray that comes with it is 8.75 inches wide and 9.5 inches long. It is big enough to accommodate one meal or four small pieces of bread. There is warranty offered for this product, but upon checking, we found that the warranty document on Amazon is hardly legible. It has very small letters, so you have to find a way to make them bigger and readable, or just ask the company if the product comes with a warranty contract that is not hard to read and decipher. They offer extended warranty, which you must pay to avail. Make sure that they will ship the extended warranty separately. If you encounter any warranty issues, you can always revert to a protection plan that Asurion offers for this unit. Aside from the cost and size, consider also the level of convenience that the coffee maker can offer, quantity or number of cups it can produce, and boldness or flavor strength of coffee that you want to make. Here’s a short list. No spillage – Check if the carafe fits securely on its holder. Will you use your unit in an RV or a houseboat? If yes, choose a unit with a plate that tightly locks the carafe. No scratching – Some units have coasters that scrape the surface of their holders. You want your unit looking brand new for the longest amount of time. 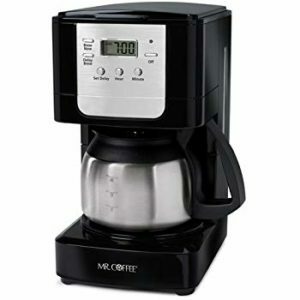 Get a cup quick – Most units would allow you to grab a cup of coffee while brewing. If you always find yourself in a hurry every morning because you are running late for work, then get a unit that has this feature. Cord length – Some units come with a 3-feet long cord; others with longer cords. Long cords can cause users to trip or get entangled on them. Auto shut-off – Most models have this capability. Manufacturers include this feature to prevent the coffeemakers from overheating or burning. Brew volume – How many cups of coffee do you need each morning or every day? Most coffee makers can brew 4, 8 or 12 cups. Allow Scheduling – If you want your unit to start brewing on its own every morning, buy one that is programmable. Easy cleaning – A few coffee maker models have plate materials that are sticky and hard to clean. Depending on your preference, you may also go for easy installation, easy to read instructions, and removable reservoir as additional features. We’ve got good coffee maker options for you here, and you just need to make sure you’re getting the one that matches your lifestyle and requirements. For big families, choose the ones with 12-cup capacities. If you do a lot of things in preparing your breakfast, perhaps the best choice is the Nostalgia. If you’ve got little kids, go with the Nostalgia. However, it doesn’t have the one-cup ahead of finished brewing feature that other units have. 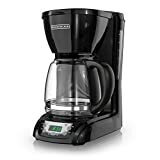 Those with little budget for a coffeemaker: you may just ignore the expensive Black & Decker units. The other three have significantly lower prices that are not much different from each other. But if you want your unit to be sturdy and would last for many years, consider the more pricey Black & Decker units. Owners of small kitchens and small homes need not feel disappointed because of their small space. If you love drinking coffee often, by all means have a coffee maker, even if it is small. Shoving away the not so important things temporarily might just do the trick. Use your cupboards to store kettle or food processors, for example. This is just to give way to things that can produce what you love the most – like a coffee brewer that can give you your great-tasting coffee whenever you need it.